The series is set to debut it's new seventh season on November 2nd. 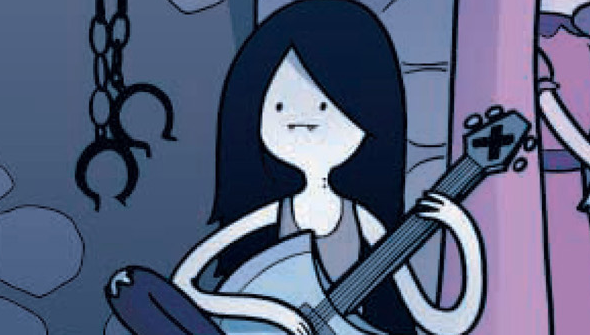 Just a few days later - on November 14th- it will be joined by Stakes, a mini-series spin-off centring on the popular character of Marceline. Marcy has been hugely popular since her first appearance on the show, and has already got her own comic spin-off series. The series will revolve around a failed attempt to "cure" The Vampire Queen of her vampirism, and will delve into her back-story. It will even reveal how she first became a vampire. It was also revealed in the panel that Adventure Time season 7 will feature another gender-swapped episode (meaning the return of Fionna and Cake) and a half-hour holiday special centred on BMO. It's looking like it's going to be another mathematical season for fans of Finn, Jake PB, and co!